SOLA MUSICA will be released on August 28. To celebrate, I’m hosting guest posts from the authors throughout this week. A beach cove, a hot summer weekend… SOLA MUSICA is where everyone’s going, to enjoy the best new music from all over. 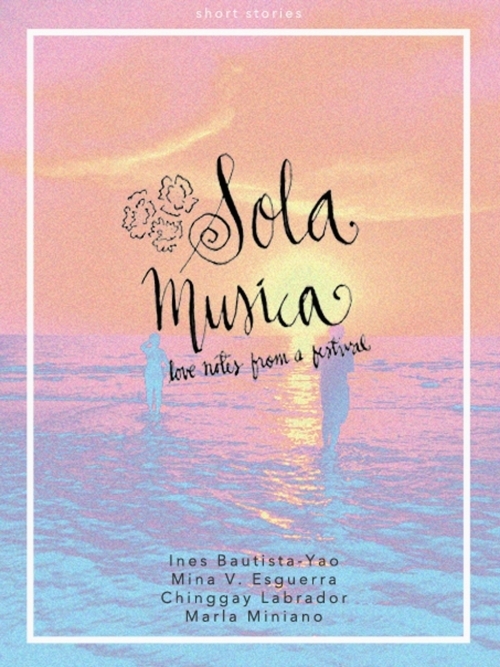 Bestselling Filipino YA/chick lit authors Mina V. Esguerra, Marla Miniano, Chinggay Labrador, and Ines Bautista-Yao each tell a story about this festival: the music, the people, the hearts that will soar (or break). I need music when I write. For people who wonder how someone like me can keep writing about people who aren’t real… don’t underestimate the power of using music to set you in the right mood. This includes placing yourself in someone else’s shoes, imagining someone else’s life, even if it’s someone you just created. For practical reasons, music also helps me focus on the story at hand. I’ve written from my dining table, a coffee shop, the waiting area of my office building, and while the location may be inconsistent, the right music can at least bring me back to the right frame of mind. Sometimes I have songs I keep going back to, even before I write, just to get myself back to that same emotional spot. I prep for angry breakup scenes with P!nk, love scenes with Portishead, epiphanies with Ivy. For Sola Musica, my story “Georgia Lost and Found” starts off on the road, and flashes back to different times in Georgia and Ken’s lives when they’ve been on the road together. I liked imagining that each time was different, because they felt differently toward each other every time. I put together a playlist of songs I consider to be great driving music, taking a person through different moods. Sometimes you need the music to keep you up, or get you grooving, or simply be part of the atmosphere.